Bell Aerospace Textron, division of Textron, Inc., has started production of the first hull assembly for the new U.S. Navy amphibious landing craft. The event was marked by a recent ceremony in New Orleans, La. The Landing Craft, Air Cushion (LCAC) is being built at the Bell Halter Inc. shipyard in eastern New Orleans, where the ceremony was held. 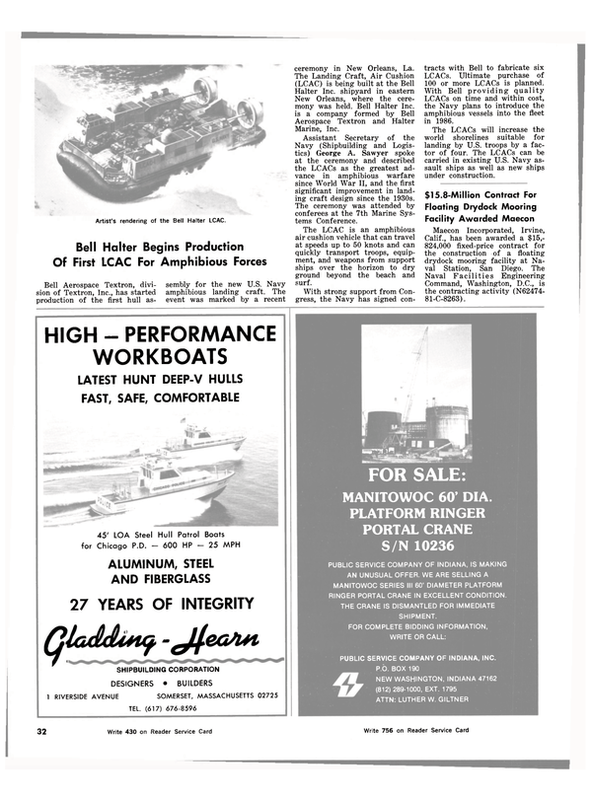 Bell Halter Inc.
is a company formed by Bell Aerospace Textron and Halter Marine, Inc.
Assistant Secretary of the Navy (Shipbuilding and Logistics) George A. Sawyer spoke at the ceremony and described the LCACs as the greatest advance in amphibious warfare since World War II, and the first significant improvement in landing craft design since the 1930s. The ceremony was attended by conferees at the 7th Marine Systems Conference. The LCAC is an amphibious air cushion vehicle that can travel at speeds up to 50 knots and can quickly transport troops, equipment, and weapons from support ships over the horizon to dry ground beyond the beach and surf. With strong support from Congress, the Navy has signed contracts with Bell to fabricate six LCACs. Ultimate purchase of 100 or more LCACs is planned. With Bell p r o v i d i n g quality LCACs on time and within cost, the Navy plans to introduce the amphibious vessels into the fleet in 1986. The LCACs will increase the world shorelines suitable for landing by U.S. troops by a factor of four. The LCACs can be carried in existing U.S. Navy assault ships as well as new ships under construction.